Got a great idea for a book that you want to indie publish? Think you’re motivated enough to attract your targeted readers to it? You ain’t seen nuthin’ yet! On Sunday, July 26, Rockin 1000, a group of over 1000 musicians, technicians, and staff joined forces near Cesena, Italy, to perform a single song, Learn to Fly by Foo Fighters. Their goal was simple enough: entice their rock heroes, the Foo Fighters, to come to Cesena and play a concert for them. The bait? One of the coolest tribute performances the Internet has ever seen. Their audience? The entire world! One thousand drummers, bassists, guitarists, and singers, were joined by volunteers and technicians to set-up, practice, and then, under the direction of noted composer and musician Marco Sabiu—atop a two-story scaffold—play their tribute performance of Learn to Fly. 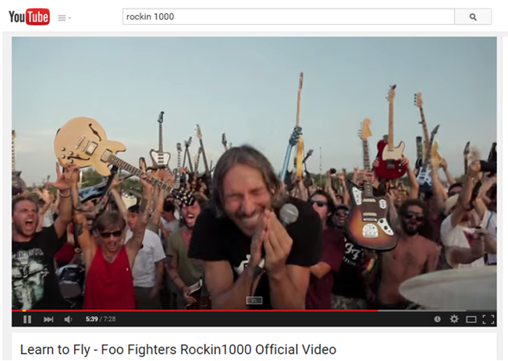 Just days later on July 30, the footage had been edited and the official Rockin 1000 video was posted online. The song was followed by an impassioned plea from event organizer Fabio Zaffagnini, almost as long as the song itself. He clarified that the video was, “addressed just to five people,” the members of Foo Fighters. Less than a week after the event and a day after the video hit the web, Dave Grohl posted a reply from the band—in Italian no less—expressing their gratitude and promising to come to Cesena. It took more than 1000 Foo fans to turn Zaffagnini’s vision into a reality; a reality that will likely accomplish one of the biggest concert events Italy’s seen in decades. Just as this tribute has captured the world’s attention, I want to be first to call it; that the Foo Fighter’s Cesena concert will likewise become an international event. Watch for a live broadcast and/or pay-per-view event, complete with BluRay and streaming copies sold to benefit music education organizations. Sponsors are probably lining up now. One might think that the lesson here is to create something monumental, throw it together quickly, and hope that it goes viral. As anyone who’s seen the Rockin 1000 video can tell you, this wasn’t any ordinary tribute event. There was a tremendous amount of preparation and coordination that went into this undertaking. Go to the official website at Rocking1000.com and you’ll see that the groundwork took over a year. Check out the preliminary crowdfunding for a pre-event promotional video. There’s a diary of the 15-month process. There are tutorials for the four groups of participants who would audition to be part of the performance. Check out the list of heavy-hitting corporate sponsors. It’s easy to see that this tingle-inducing tribute didn’t happen overnight. Redbrush helps passionate writers and creators share their books with the right readers and audiences. I’m sharing this post on Redbrush's blog page for two reasons. First, I want to keep hopeful booklovers from organizing 1000-member readings of Go Set a Watchman … next week … in hopes of duplicating Fabio’s success and inviting Harper Lee to visit their hometown or university. Let the woman rest! Second, I’m hoping that all indie published authors are heartened by Fabio’s example that with good planning, great support, and a clearly defined goal in place, it’s possible to use the Internet and social media to generate real and legitimate support and esprit de corps for their project—before, during, and after its launch. Anything worth doing is worth doing well and documenting every step of the way, just as Rockin1000.com has done. Hard work can be rewarded with great results. Sharing and sharing a “like” can make a world of difference … for good.